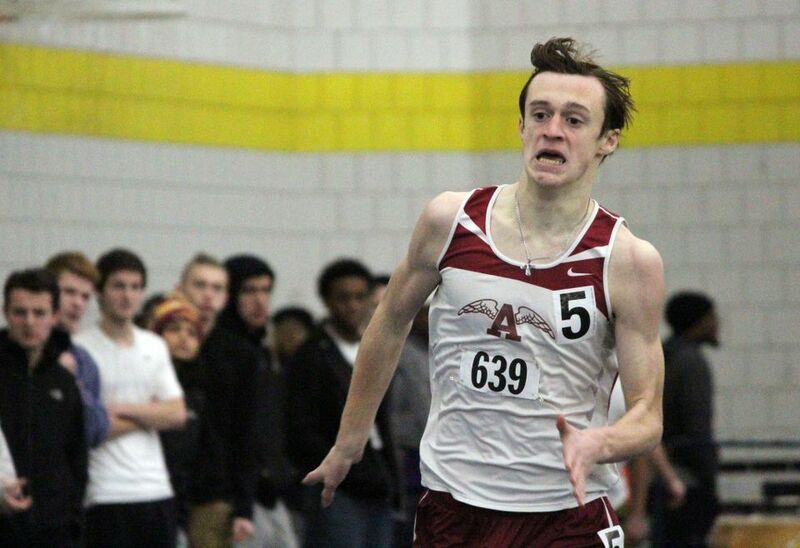 At the beginning of their season, the ARHS boys’ indoor track team had high hopes of winning Western Mass for the sixth year in a row, and then competing in Nationals. Junior Aiden Foucault Etheridge had a strong season with a personal best of 1:54 in the 800m, and he qualified for nationals in the 600m. Much of Foucault Etheridge and the distance team’s success was credited to Coach Bob Rosen, a long-time coach and former runner who is a huge asset to the Amherst track program. “He is incredibly knowledgable,” said junior Gabe Randall, who ran the mile under Rosen in the 16/17 season. Rosen also coaches professional marathoner Philemon Terer, who has placed well in many races thanks to Rosen. Rosen works the athletes hard, with practices five days a week and meets many weekends. The schedule for indoor track practices is as follows: a brutal workout on Monday of 10x400m, a long distance day on Tuesday (10-12 miles), a speed workout on Wednesday of 8×100, a recovery mid distance run on Thursday, as well as ice baths if there is a meet Friday. On Friday, if there is a meet that day or Saturday, they will rest; if not, they will do another workout. “It’s taken me three years to get me to the point where my body can do that,” said Foucault Etheridge. Throughout the season, the team competes in smaller dual meets every weekend. These meets are used more for training and personal bests, than for going all out for the win. This allows athletes to try different events, and not be stuck doing the one thing they think they are best at. “We really train for the end of the season, the dual meets are more for personal (bests) not winning,” Foucault Elthridge said. The regular season came to a climax at Western Mass, a meet the Hurricanes have won the last five years running. This year, Amherst fell short due to a disqualification and other problems. In fact, the only points from Amherst came from Jack Yanko, Foucault Elthridge, Andre Sheppard and Julian Fischer-Frank. At the All-State meet the 4x800m team qualified for Emerging Elite nationals, even with senior Sheppard, an integral member of the relay, in Brazil. Sophomore Aidan Shea filled in, and alongside him sophomore Yanko, senior Fischer-Frank, and Foucault-Etheridge, helping the team move forward and compete in nationals. Nationals were March 10, and the 4x800m team had high confidence going in. Amherst qualified for Emerging Elite nationals which happens at the same place as Championships, but is the second tier. While they weren’t in the big race, if the 4×800 team had a time within the top six of both Championships and Emerging Elite combined, they would receive the title All-American. “We were looking for top six at nationals which is All-American,” Foucault Etheridge said. Two years ago, the Hurricanes 4x800m got third at nationals with a time of 7:45. This year, the 4×800 fell short. Foucault-Etheridge ran a 1:57, Sheppard a 1:59, Yanko a 2:02, and Fischer-Frank a 2:02. The Hurricanes ended up in 7th place in Emerging Elite, and nowhere near top six in the championship meet.